So, these are barely a fraction of my hot-pink eyeshadow variants. I LOVE hot pink eyeshadow. These three were particularly close, and your average makeup-lover REALLY only needs one. Sugarpill Dollypop is a vivid hot pink, with a hint of fuchsia. 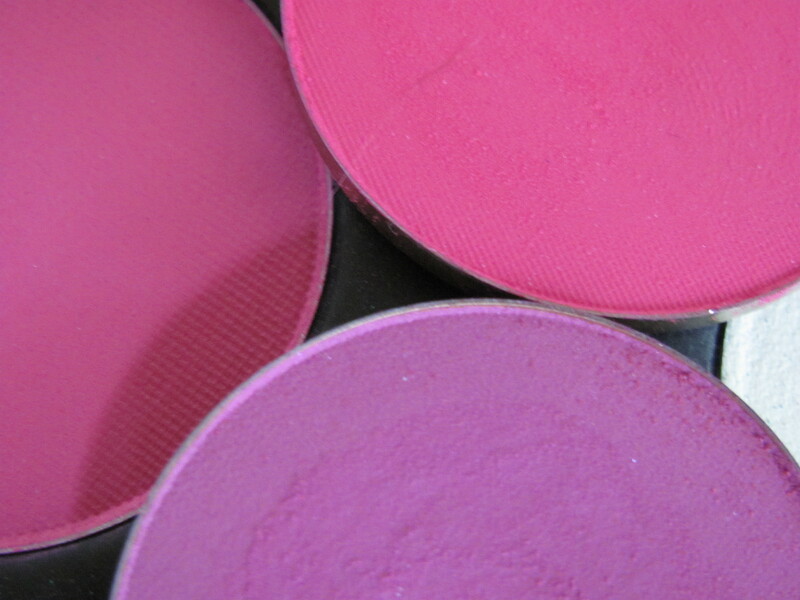 MUFE #75 is a true hot pink, and #26 is a true fuchsia. ﻿These two shades look almost identical at first glance. 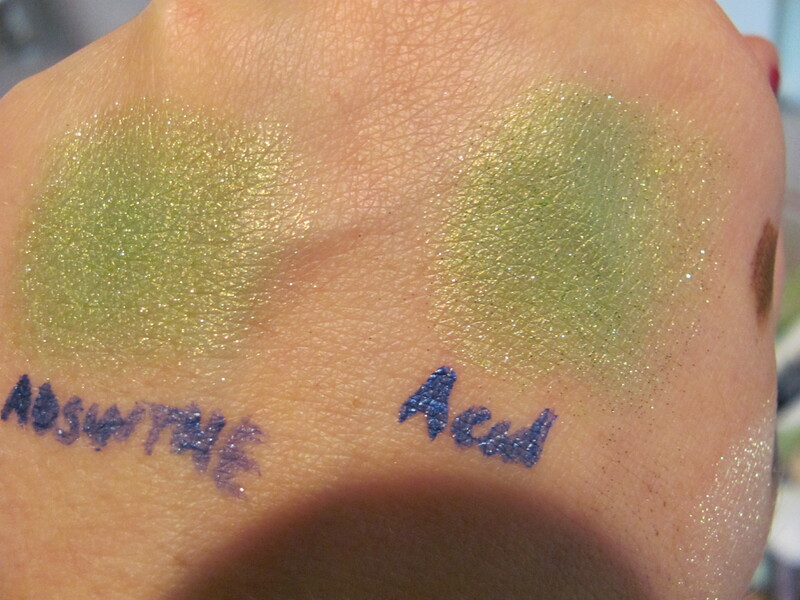 Absinthe is a bit more shimmery than Acid, though. In practice, they handle very differently. If you don’t wear lime greens very often, you may not need both, and your preference may come down to how you usually apply your shadow, and how much you usually spend on your makeup. While I try to avoid buying the same shade ten times, if you buy make up online a lot, you’re bound to end up with a few…. similar colors…. We may as well learn something from it, right? As I end up finding these pairs, we’ll match them up, and see which I grab more, and why. This will not be a regularly scheduled series, but will be published as duplicate shades are found, and tested. Please note-I don’t buy much drugstore makeup any more. I’ve found that I’m usually not happy with products I can’t swatch or handle before buying, and the customer service is generally better purchasing from independent makeup companies, for the price. I don’t doubt there are many great drugstore dupes, but I freely admit to not having patience or inclination to find them. Sugarpill Weekenders and MAC Cornflower are both loose eyeshadows of a medium blue-violet, with sparkles of pink, blue, purple. 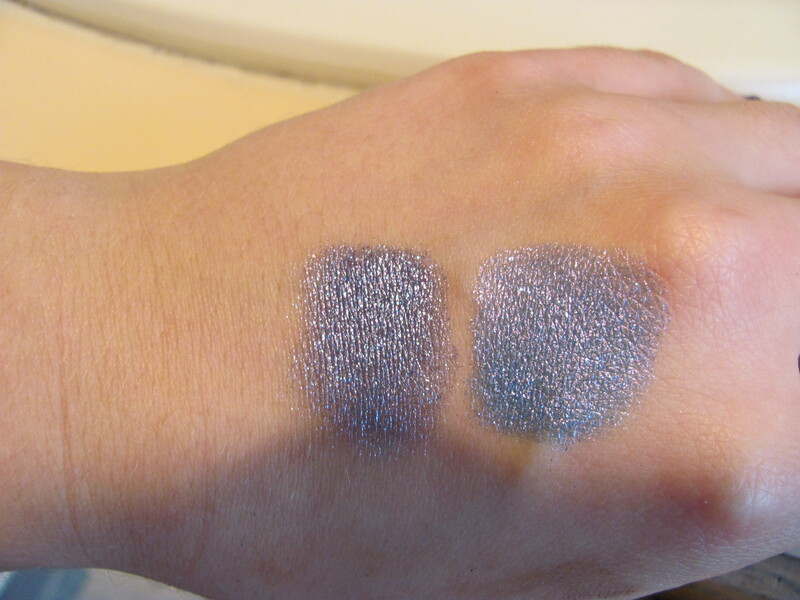 In the swatch pictures, cornflower appears SLIGHTLY more blue, but the difference is barely visible to the naked eye.